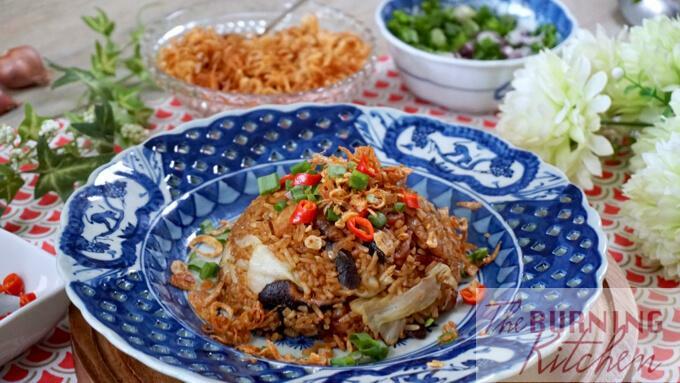 Best of all, it is a really simple dish that you can make with a rice-cooker! 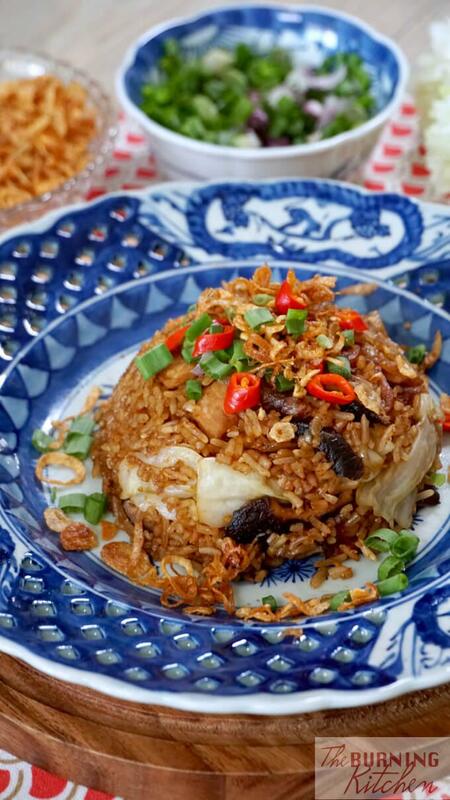 Simple pre-fry the ingredients, place them on top of the rice and set the ricecooker to cook as per normal! Wash the Chinese dried mushrooms and dried shrimps. Then soak the mushrooms and dried shrimps in separate bowls in hot water until soft. Dice the pork and marinate in the marinade ingredients for about 20 minutes. Soak the Chinese Sausage in boiling water for a few minutes, then remove the skin from the Chinese sausage and dice. Slice the cabbage into medium sized pieces. Then cut the spring onion into small pieces and refrigerate for the garnishing. Then wash the rice and drain off excess water. Once the mushrooms are soft, remove the stems completely and discard. Squeeze out the water and cut each mushroom into 4 to 6 pieces. 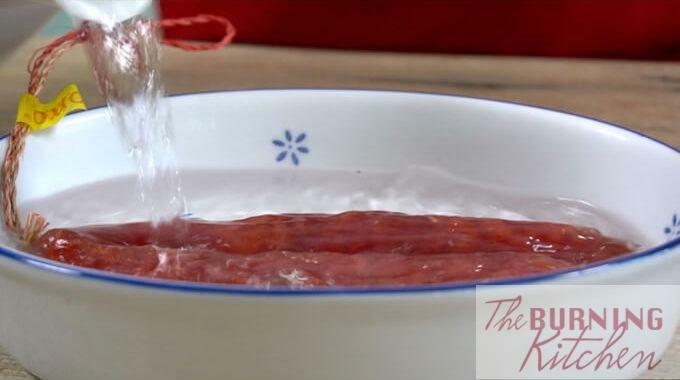 Set aside the soaking water for later use. Once the dried shrimps are soft, remove them from the water and set aside. Mix the mushroom water and dried shrimp water. Sieve the mixture and add more water to make up to 1 3/4 rice cups in volume (see Tip 2). Put the 3 Tbsp of oil in a wok over medium heat. Add the dried shrimps and fry for 2-3 minute, then add in the chopped garlic and fry until fragrant. You need to control the fire to ensure the ingredients do not spatter/burn (see Tip 3). 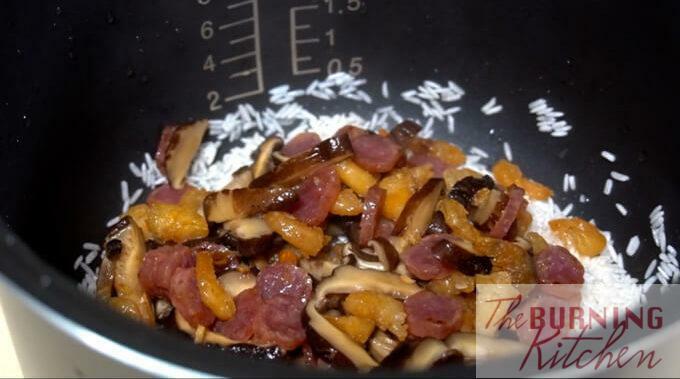 Add the Chinese sausage and Chinese mushrooms and continue to fry for another few minutes. Add 1 tsp of salt and the mushroom-shrimp-water mixture into the wok and bring it to a boil. Then switch off the fire and pour the mixture on top of the rice. Do not stir! Put the cabbage on top of all the ingredients and set the rice cooker to cook as per normal. 10 minutes before the end of the cooking time, add the marinated pork on top of the cabbage and continue to cook in the rice cooker. Once the rice is cooked, add the 1 tbsp of dark soya sauce and 1 tsp of sesame oil and stir in using a pair of chopsticks (see Tip 4) to mix well. Best served hot with crispy shallots (get recipe here), spring onions, and chillies. You can also substitute crispy shallots with crispy garlic! Know Thy Cabbages! There are different types of cabbage available in the local markets and supermarkets. You can learn to tell apart by their shapes: round (spherical), round (slightly flattened like a rugby ball) and spear-shaped (also known as sugarloaf cabbage). Choose round and slightly flattish cabbage for this dish, as it has thicker leaves that give a more crunchy texture after cooking. This is also the same cabbage I use for making steamed cabbage rolls, a tasty and healthy nostalgic dish. 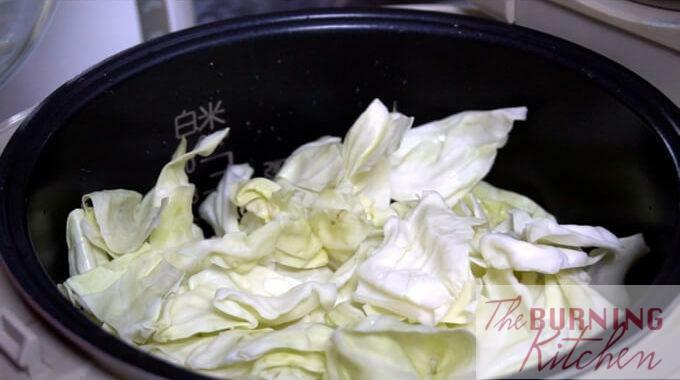 The spherical shaped cabbage has thin leaves and tend to become mushy after cooking. 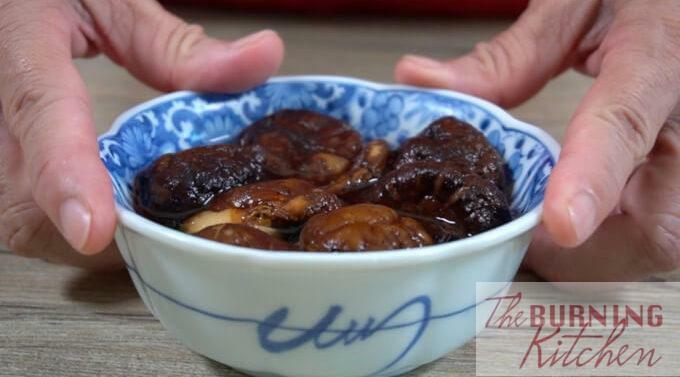 Learn how to choose Chinese dried shiitake mushrooms here. Pre-frying the ingredients will make them fragrant, so that the fragrance and flavours will seep into the rice during the cooking process. 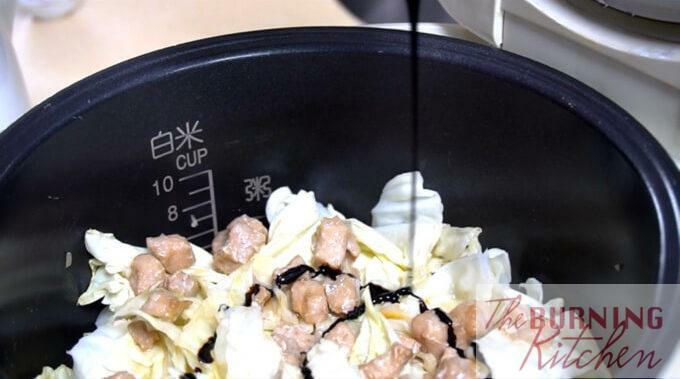 Be careful NOT to stir the rice when pouring the pre-fried ingredients into the rice cooker. Otherwise the heat will not penetrate through the rice grains resulting in uncooked rice. To ensure that the pork does not get overcooked, add in the pork only in the last 10 minutes. Alway use 1/4 less cups of water than the amount of rice. This is to take into account that the cabbage will also release water during the cooking process. If you add too much water, the rice will become soggy. Do not fry the garlic before the shrimp as the garlic tends to burns easily before the shrimp becomes fragrant. 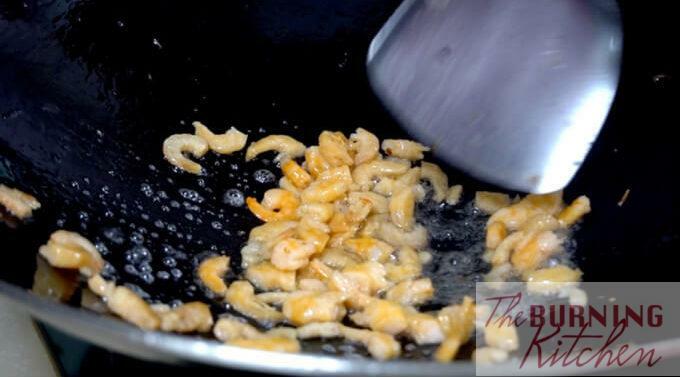 Turn the heat down slightly if the oil starts to spatters when you add in the dried shrimps. Once the spattering stops, you can turn the heat back up. Use a pair of chopsticks when stirring the black sauce into the rice to avoid breaking the rice grains. 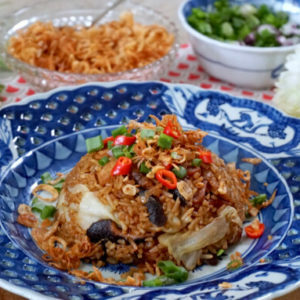 This Cantonese favourite is a delicious and easy one-pot dish that can be cooked using your rice cooker, leaving minimal mess in your kitchen! Wash the mushrooms and dried shrimps. Then soak the mushrooms and dried shrimps in separate bowls in hot water until soft. 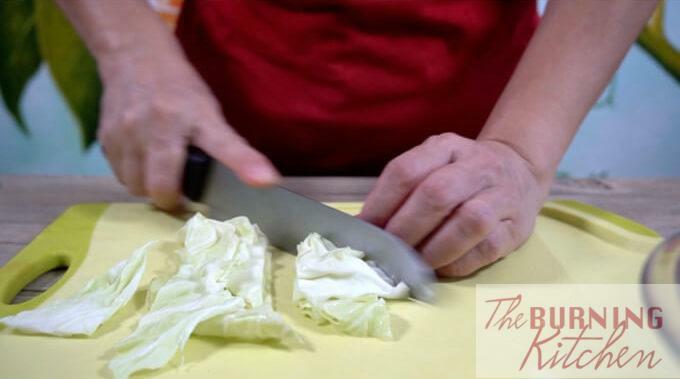 Slice the cabbage into medium sized pieces. Chop the spring onion into small pieces. Wash the rice and drain off the water. Put the rice into the rice cooker pot but do not set it to cook yet. Once the mushrooms are soft, remove the stems completely and discard. Squeeze out the water and cut each mushroom into 4 to 6 pieces. Remember to keep the soaking water as we will need it for cooking the rice. Once the dried shrimps are soft, remove them from the water and set aside. 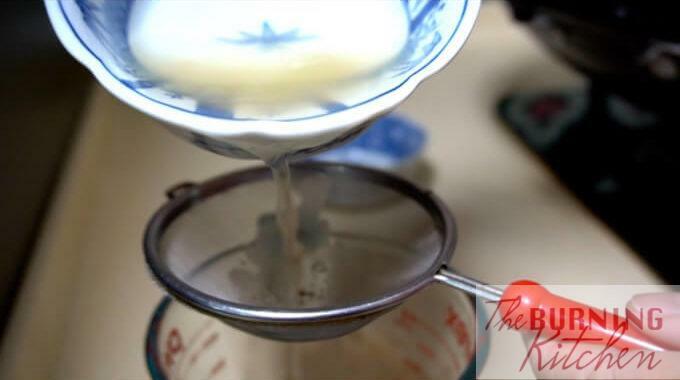 Mix the mushroom water and dried shrimp water. Sieve the mixture and add more water to make up to 1 3/4 rice cups in volume (see Cooking Tips). Put the 3 Tbsp of oil in a wok over medium heat. 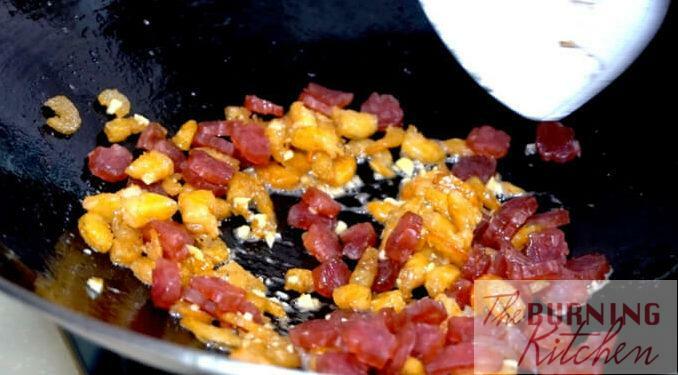 Add the dried shrimps and fry for 2-3 minute, then add in the chopped garlic and fry until fragrant. You need to control the fire to ensure the ingredients do not spatter/burn (see Cooking Tips). Add 1 tsp of salt and the mushroom-shrimp-water mixture into the wok and bring it to a boil. Then switch off the fire. Pour the mixture on top of the rice. Do not stir the rice otherwise the heat will not penetrate through the rice grains resulting in uncooked rice. 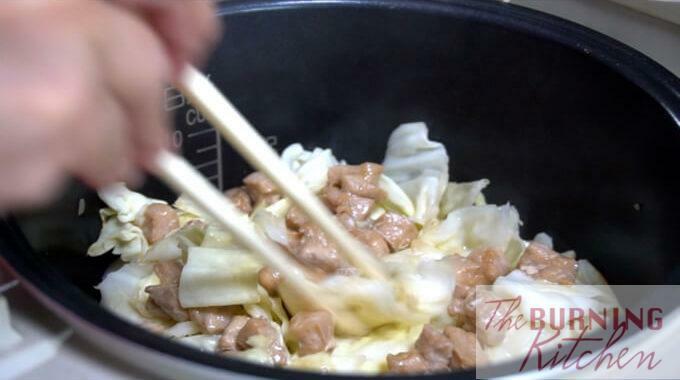 10 minutes before the end of the cooking time, add the marinated pork on top of the cabbage and continue to cook in the rice cooker (see Cooking Tips). Once the rice is cooked, add the 1 tbsp of dark soya sauce and 1 tsp of sesame oil and stir in using a pair of chopsticks (see Cooking Tips) to mix well. Then serve garnished with spring onion, fried crispy shallot and fried crispy garlic. Thanks for this great one-pot meal! I managed to prepare this in 90 minutes as advertised for my family meal. It tastes great but I have a question, my cabbage turned out limp looking after cooking, not like in your pictures. Did I buy the wrong cabbage? The one I got from NTUC is the small, green and very round cabbage. But when I was cutting it, I realised that the cabbage used in your pictures seems thicker and whiter. I’m glad that you love this recipe! From your description it sounds like you were using the Beijing Cabbage which is very round, much smaller and the leaves are thinner. The cabbage that I always use is the Malaysian Round Cabbage, which I believe is from Cameron Highlands. It is larger and has a flattened shape, and the leaves are more sturdy and will soften but will not wither during the cooking process. Thanks for your feedback, I have added this into the ‘TOP TIPS’ for this recipe.